This is an all valve (tube) circuit pre-amplifier with balanced line microphone inputs. Featuring phantom power at 48 volts and phase reversal switches. 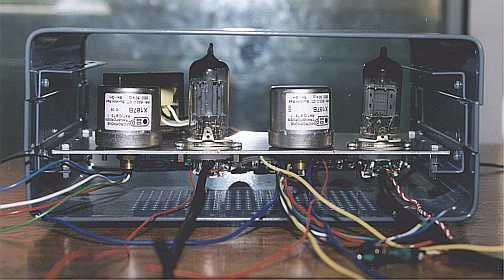 Each section comprises of an ECC82/12AU7 dual triode valve which amplifies the microphone signal via an input transformer. An instrument input is also supplied which bypasses the transformer and gives a direct input for guitars or for a line level input. As this pre-amplifier is designed for the home studio, it has -10dBV unbalanced outputs rather than balanced +4dBu outputs. It can however drive balanced line inputs if 'ground compensated' wiring is employed.